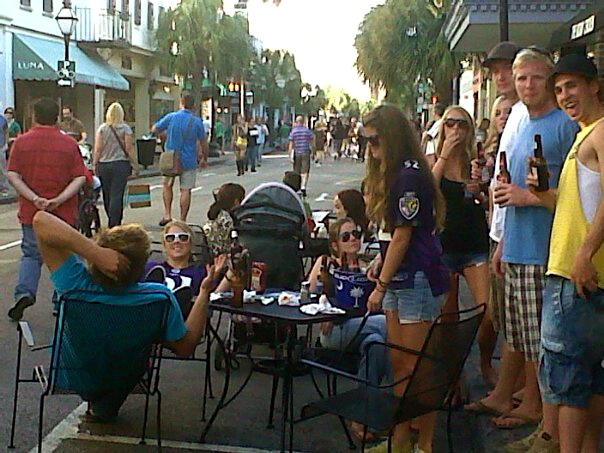 Last Sunday was one of Charleston’s “Second Sunday Pedestrian Only on King St” days. Starting at Calhoun all the way down to Queen, King Street is closed off to pedestrians only from 1-6pm. I stumbled upon this event back in October when I was attempting to ride my bike down King St. An officer stopped me and asked if I could please walk my bike the rest of the way to my destination. Flustered I was going to miss RAVENS kick off, I scadaddled off confused as to what was going on. By halftime, restaurants had moved tables outside and the streets were filled with all walks of Charleston life. Once the game was over, celebration of a win against the Stealers moved to the streets. So what if this happened every Sunday? Everyone has a great time, it brings tons of people into local businesses, and it’s a change of scenery/throw back to how things used to be. The only qualms with the event are from the police officers standing on every corner. From what I understand, the city pays for the streets to be closed and for officers to make sure no cars drive on King. If I were a police officer, I would enjoy being outside and people watching, but then again, maybe that’s one of the several reasons I am not a police officer. Personally, I think it’s a fabulous idea and should take place every Sunday… what do you think?